My blog is number 71 out of 257. Follow the link from my blog to the next, and the last will link to the first on the list. After doing that, follow on to Blogfest blog number 72: Seductive Musings to see what other great prizes may be in store for you. But wait, as they say in the cheesy commercials, there's more! Don't forget about the massive BlogFest 2010 grand giveaway! Head on over to http://ajourneyofbooks.halfzero.net and click on the Tracking Site link to head to our own exclusive tracking site. Once there you can register with a valid email address (to be used solely for the purpose of contacting the winner). This site will allow you to track your progress through BlogFest 2010! You can log on from anywhere at any time and continue where you left off. The best part is that every blog that you visit and mark off through this tracking site will give you one entry into the massive giveaway! They have a great collection of books, goodies and other swag that is looking for a new home! I'm so happy you are a participant in Blogfest. Please enter me. Stopping by on the blogfest hop...no need to enter me in your contest - just wanted to say hi! Now I'm craving chocolate! LOL Thanks for having the contest. I'm a GFC follower. GFC follower and I live in Canada! I am following via GFC as Tracy Taylor, as for a comment, you have my two favorite things, books and chocolate - now all I need is the kids away and a hot bath and I will be one happy momma (if I am lucky enofe to win!) sounds great to me!. :) I am a follower! Thanks to blogfest, I've found your blog and started to follow you. This is my first stop this morning. I'm looking forward to seeing who all is participating! Hi Cate! I'd love to win this giveaway. I would love to be entered. I am already a follower. Chocolate and books, what could be better? Super cool! Gotta Love Books and Chocolate! I am a follower! Looks like a fun pack! Count me in. Look forward to your posts. Happy Blogfest. Just stopping by to show my support for your participation and to wish you a great weekend. 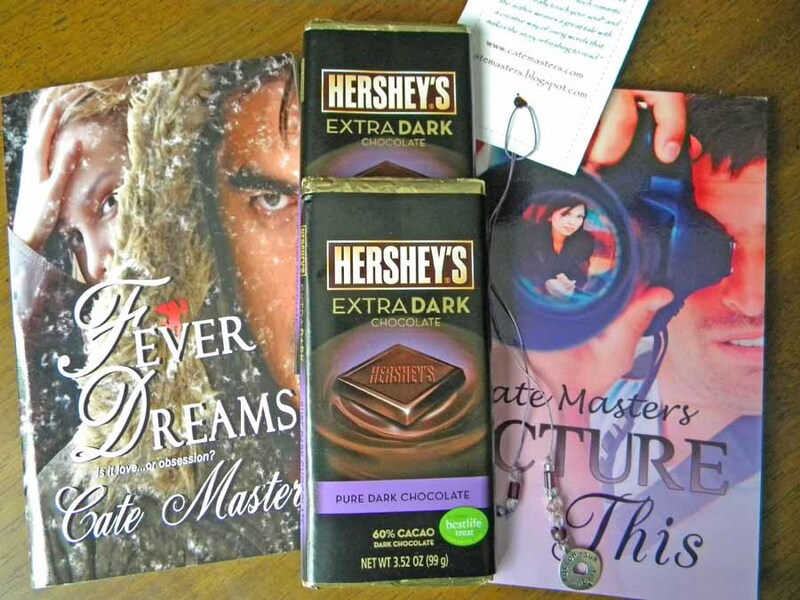 I love the idea of winning chocolate with a book. What a fabulous pairing! Glad ou are part of Blogfest...the giveaway is fantastic. I am a new follower! Awesome giveaway! I am a GFC follower (Colleen Turner). Thanks so much for this amazing giveaway! I'm a GFC follower. I'm having a ball in this bash. I don't live in the US or Canada but I thought I'd pop in and say hi any way. "Hi!" Is there anything better than chocolate and books?? gfc follower...thank you for the giveaway! Thanks for making this giveaway available to those in Canada! I'm now following you through my Google Reader. Thanks for being part of this awesome blogfest and the opportunity to enter. I am already a follower! Thanks for the giveaway! I'm a follower. Great Contest. New follower! Excellent combination of yummy things! Thanks so much for the chance to win your giveaway! I'm a follower. I'm a new follower of your great blog. You have some really interesting posts. 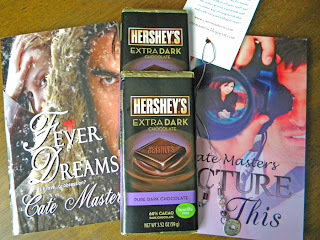 Thanks for the dark and yummy giveaway. Seeing that chocolate bar makes me HUNGRY! Another great giveaway, I'm having so much fun! Thanks so much & I'm a follower! Thank you for the giveaway! :) I'm a new GFC follower. I am a follower. I NEED CHOCOLATE and BOOKS please -it is my Birthday this month. what a great idea! Chocolate and Cate . . . a great combination!! Thanks for hosting the giveaway- great prize package. Hello, thank you for sponsoring a Blogfest giveaway and the opportunity to participate. I live in Canada and I am a new follower. Thanks for the giveaway - Happy blogfest! Thanks for the Blogfest and great giveaway. Thanks for the entry and have a great weekend. I am a new GFC follower. Please sign me up for your giveaway. MMM... Dark chocolate... You know me well. Great Giveaway! So much fun. What a tasty giveaway...lol. I also love your blog header and the colors. I so want to be entered into your giveaway. I follow and live in the US. Thanks so much for this giveaway! I now follow with GFC~Great Contest! I'm a follower in the US. You have a lovely site. Some interesting posts. Great giveaway you can't go wrong with dark chocolate. New follower and first time visit to Blogfest. I love it! What a great giveaway! I became a follower (as sneakybea). Thanks! Thanks for the great contest! I'm a follower. Great giveaway! I'm a GFC follower. I am a GFC follower. Thanks for the great giveaway. Books and chocolate are perfect together, thanks! Awesome giveaway! Please enter me!! Great giveaway thanks so much. I'm a follower. I am a follower and reside in the US! Enter me to win, please! WOW, what a fabulous giveaway. That dark chocolate would make my husband a very happy man! Thanks for the chance at a fabulous giveaway! I'm a follower. Thanks for a chance! Oh, and that Hershey chocolate is awesome! I would like to be entered! Google follower! Great giveaway! I am a new follower from blog fest hopping! Thank you for offering the chance to win such a wonderful prize!